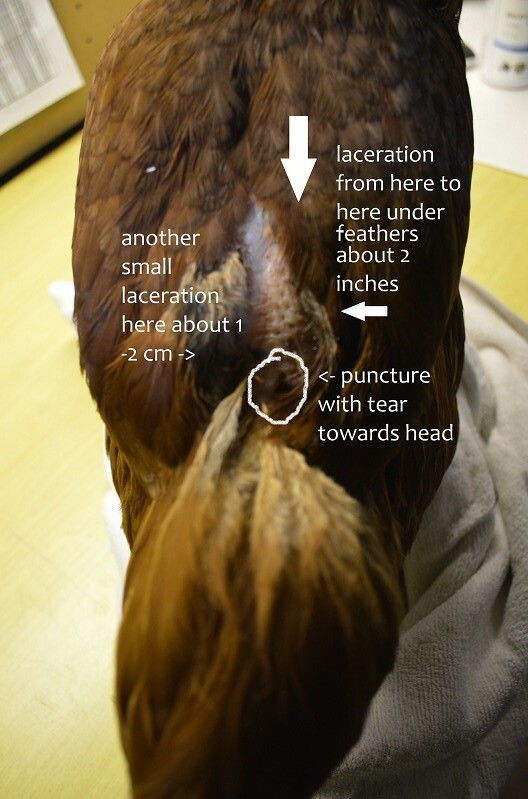 This is my story of my best hen "Red" who got attacked by what we believe to be a hawk. It is a story of healing. 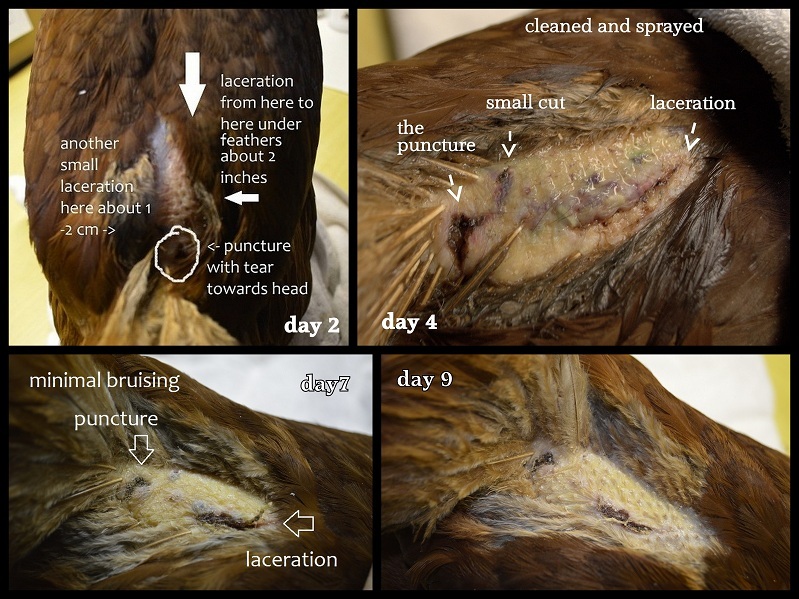 It is not as traumatic as other hawk attacks I have read about here on BYC But, it is our story. Background: I have 3 young (just over a year-old) hatchery birds of different breeds. These 3 birds are my only girls on my little 6 acres mini hobby farm and are considered pets. In my part of the West Cascade Foothills, we have more than hawks. Bear, cougar, bobcat, coyote, fox, fishers and other weasle like things and many large BOP like merlins, red-tailed hawks, osprey and bald eagle and horned and barred owls. Everything wants to eat my girls (can't say I have not eaten one myself either). Sidenote: At the time of this article, I am working on a deluxe predator proof run for them for when I am away (I do not have a LGD or a fence to keep one). I let them out only if I am there physically in the yard close by like a rooster. If I have to go in and out or around the property, they are in a tractor or coop/run. The run is gonna have lots of enrichment for them like bathtubs, deep litter, branches of varying heights to jump up and down on, rocks for sharpening beaks and a garden surround of herbs to munch. The huge tree protects the run from swooping hawks so why did she get attacked? Cause she "flew the coop" quite literally. The girls were all taking a bath together in the sun today. Guess that's a good sign that Red felt comfortable enough to bathe. Too bad a chicken bath is in dirt or in our case a sandbox. So, I just let her finish and then took her in to clean her up. 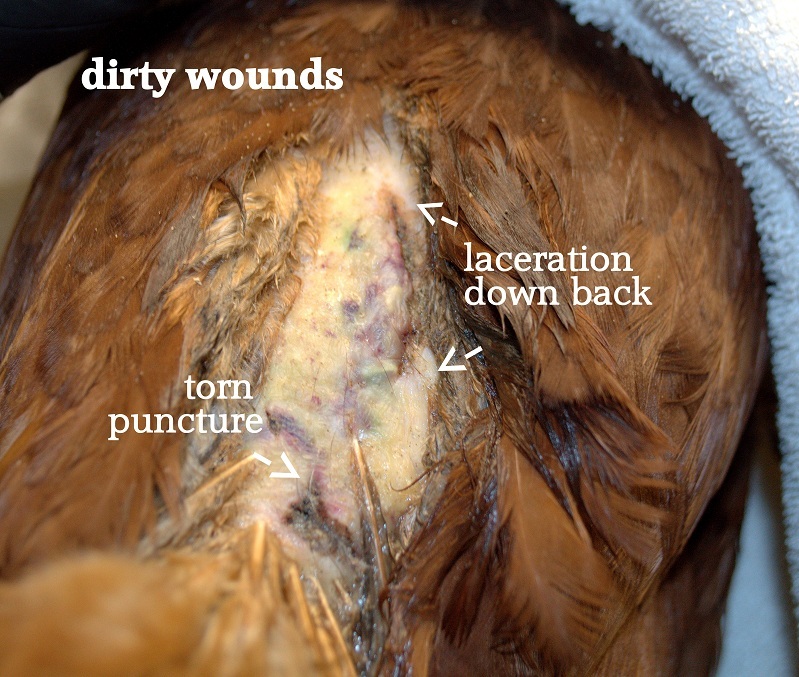 Of course the wounds had debris all up in them. I got some warm water and a syringe and flushed them out gently and used Q-tips to help brush the stuff out. Then I sprayed with vetericyn gel and sent her on her way. You can see from the 1st photos that the swelling has gone down around the big gash. She does NOT like being sprayed and is still tender but I guess she is used to me fooling around with her especially after the bumble-foot episode. She takes it pretty well if I let her tuck under my arm rather than a towel over her head. She still is pretty nervous when I take her out of the coop. She looks around like her life depends on it ('cause it kinda literally does) and she shakes and makes a whining sound. Today I could really see the feathers starting to pin-in. That is what all those spiky-looking things are on her back skin. The puncture is still pretty deep but I can see new tissue starting to fill it up. 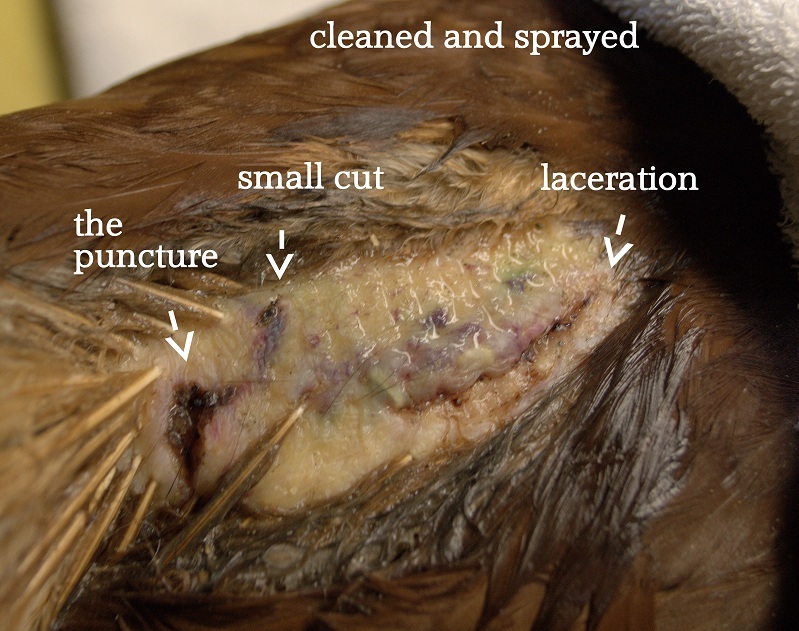 Large laceration is half the length is was. NOTE: I did not use bandages or saddles and I have no roos to worry about. 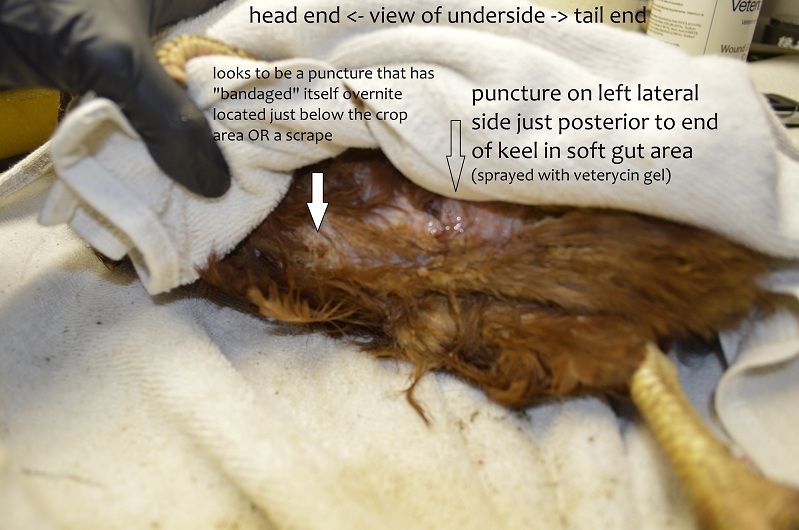 She preened the existing feathers to cover up the wound herself. I also put the feathers back over after I treated. 2 weeks later. All better. Excuse the photos - my dslr is at the hospital - I can tell a huge difference in the quality of the pics.